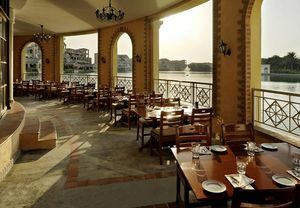 DUBAI, UNITED ARAB EMIRATES--(Marketwired - Mar 20, 2014) - Tantalizing aromas from a wood-fired pizza oven and indulging flavours of the Italian coastline are perfect for a lakeside Friday afternoon retreat at one of the most prominent Dubai hotels near the Al Maktoum International Airport. Cucina, the Italian kitchen located inside the Courtyard by Marriott Dubai Green Community hotel has announced an All-Italian Friday Brunch every week from noon to 4 p.m., where guests may enjoy all the comforts of fine Italian cuisine while surrounded by the ambience of lakeside views and the pristine pool of this upscale 4-star hotel in Dubai. The wood-fired pizza oven of Cucina bakes crispy thin crusts while chefs serve a delicious variety of traditional Italian roasts, Mediterranean BBQ, cheeses, homemade sorbets and desserts. Welcoming families, children may make their own bruschettas, decorate cookies and enjoy face painting while adults are serenaded by the tunes of a live duo. After indulging in the savoury Italian favourites, guests are welcome to enjoy the hotel's newly renovated outdoor pool and bask in the warm Dubai sunshine around the pool's spacious deck. A fun and affordable pick among things to do in Dubai on a Friday afternoon, this flavourful brunch experience is free for children ages 6-12 years and priced at just AED 165 per person including soft beverages, or AED 275 per person including house beverages. Now is the best time to book this relaxing end-of-the week event and making reservations is easy by calling 04 885 2222. Open daily from noon to 3 p.m. for lunch and 6 to 11:30 p.m. for dinner, Cucina is located on the lobby level of the Courtyard by Marriott Dubai Green Community hotel and features trattoria-style cuisine that reflects rich, old-country flavours in traditional anti-pastas and salads accompanied by homemade pastas and risotto. An upper level bar offers an extensive selection of fine wine and beverages with stunning lakeside views. Cucina, The Pine Grill and Aquamarine offer delicious on-site dining and for added choices the hotel's Dubai restaurant guide features a variety of nearby dining options for the pleasure of Courtyard guests. The Courtyard by Marriott Dubai Green Community is an upscale hotel located near the vibrant development offering travellers easy access to many of Dubai's most distinctive destinations and three major airports. Luxurious accommodations, high-tech event venues, lavish amenities and unmatched service combine to create an exceptional hotel experience. A refreshing outdoor pool and state-of-the art fitness centre complement the impressive selection of on-site restaurants to ensure guests have everything needed for a relaxed and productive stay whether travelling to Dubai for business or leisure. Sample authentic pastas, pizza, and more at Cucina’s All-Italian Friday Brunch, located at Courtyard Dubai Green Community.